1. Use a food processor with the S blade to finely chop the parsnips and carrots until they look like small pieces of rice. Place in a bowl. Add all remaining ingredients except for the cashews and stir to combine well. Add cashews just prior to serving. Serves 2 as a main, 4 as a side. This looks so delicious and I can see it being a huge hit at pot lucks! The curry powder sounds lovely – a really great blend of spices and as you said you can always just spice it up with some extra chilli! I can definitely see this being a hit in our house as my sons LOVES pineapple and as long as I don’t get carried away with the spice I think he would love it! I cannot wait to try this! I love parsnip rice, and I can imagine that curry with pineapple is incredible. Great recipe! I just made it and added cilantro and a bit or sriracha. Delish! Thank you for a great recipe! I’m, intrigued! 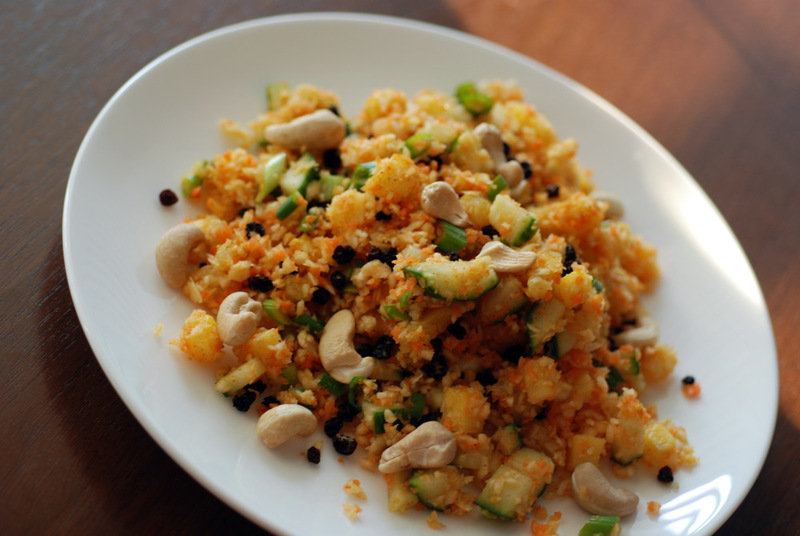 I tried cauliflower rice and wasn’t a fan, but maybe parsnip. Plus you added so many great flavours (hello pineapple and curry! ), how could I not like it? Maybe that was the problem with the cauliflower! 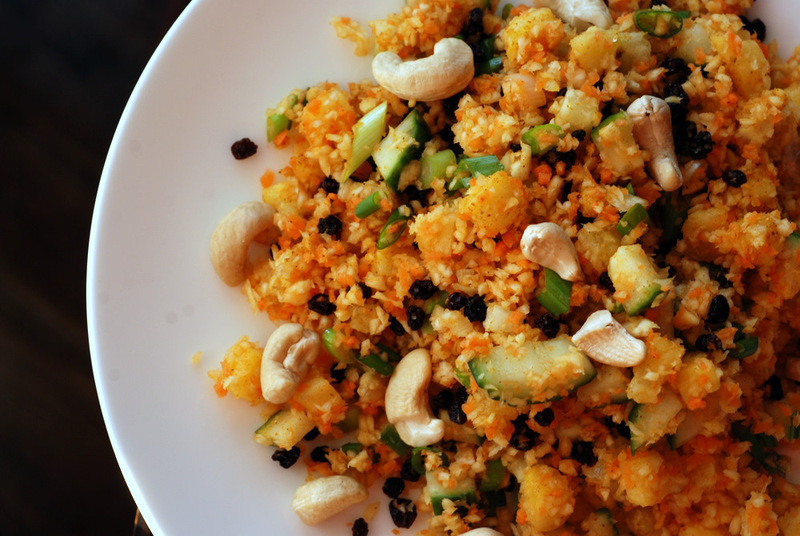 Raw veggie rice is definitely all about everything else! I’ve done a super simple parsnip rice with just lemon zest, lemon juice, olive oil and salt, too, which was pretty darn tasty. I think parsnip has more innate flavour then cauliflower, though, so it could work better more solo. If you try it, let me know how you like it! i wouldn’t have thought that you could eat parsnips raw, but I learn something new from you every day! Yay! So glad to have an awesome parsnip recipe to pin! Janet, we’re going to have to find you some scratch-and-sniff cookbooks. I love this idea! 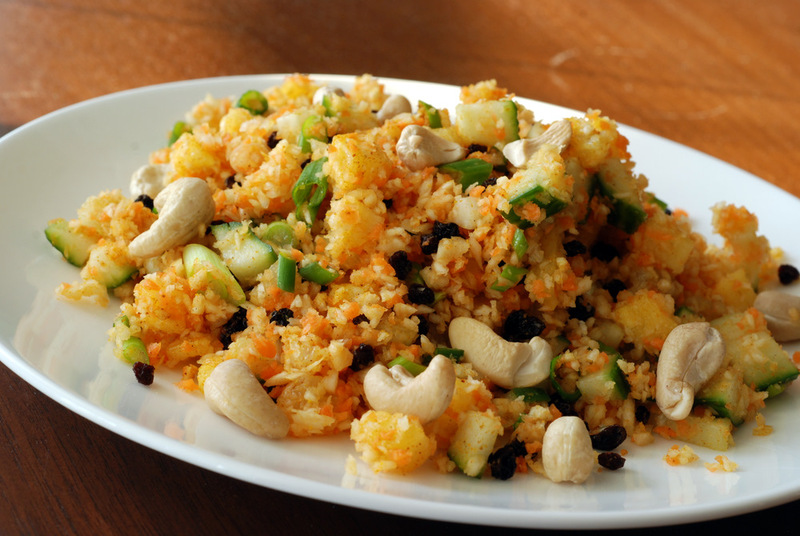 I’ve been meaning to try cauliflower rice for a while, but now I might have to try this version first! I ate a lot of fried rice when I was in Singapore and Thailand (even for breakfast), and it got a bit boring after a while…so this recipe would be a nice fresh change! Beautiful raw dish! I’m totally inspired. This looks outstanding! So fresh. What a great raw entree! I love this–so creative1 I need to make more raw dishes. Thanks for sharing this with Souper Sundays. Great looking recipe and so creative! I love parsnip rice! I bet it is delicious with the curry flavor! Made this yesterday.. kind of!! I kind of mixed it with another of your recipes, as I had quite a few things missing :O . Soooo, I had no pineapple, no parsnips, no currants or lime.. So I made the “rice” with cauliflower and broccoli, then replaced the lime juice with orange – to add the missing sweetness back in. It was ..good, but I NEED to make it properly!! When I do, would you mind if I blogged about it, please?? I’d link it back here and say that it’s your recipe, of course!! So I made the recipe properly yesterday, WITH all the ingredients 😉 and WOW!! It was delicious 🙂 . Ohh I love all your raw recipes and would love to see some more!! Unfortunately I forgot to take pictures of the dish this time 😦 but next time ((and there WILL be a next time!!)) I shall ensure that I capture it 🙂 . Yes, please do!! Your raw recipes always inspire me!! I wonder if the curry taste that you don’t like is actually curry leaves. To me, they have almost a soap-y taste. I know that’s it for me. I can’t wait to try this recipe. It sounds yummy!!! Thanks Deby! Please let me know how you like it. Maybe curry leaves do something funny in the curry powder? I actually really like them when I add them from frozen.